Acopa Nova porcelain dinnerware blends style and strength to showcase culinary masterpieces without compromising durability. This line offers a vast selection of plates and bowls, so finding the perfect piece is easy. It’s great for serving multiple courses, from savory appetizers to decadent desserts! Acopa Nova dinnerware features sleek, curved edges for a softer look and feel, which complements the thin body and creates a delicate, modern appearance. Each piece is designed with an eye-catching, asymmetric, free-form coupe shape and is creamy white to serve as the perfect back-drop for fresh, vibrant dishes. Because it’s made of porcelain, Acopa Nova dinnerware is designed to last. Not only is it fully vitrified to prevent moisture absorption, but it’s also glazed, which protects its color and prolongs its lifespan. For hearty dinnerware with a trendy flair, Acopa Nova is the perfect choice! 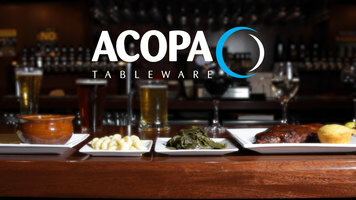 Showcase culinary masterpieces in style with Acopa Nova dinnerware. Trendy, but durable, this line is a great choice for upscale cafes, bistros, bars, and brunch hot-spots. Its creamy white color and free-form coupe shape ensure that it's the perfect back-drop for vibrant dishes, while its glazed, porcelain design makes it gracefully withstand high-volume use. 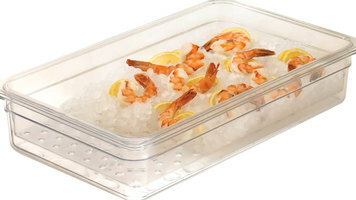 Camwear food pans are ideal for storing, transporting, and serving food to your customers. Available in various sizes and styles, these Camwear pans meet all your food service needs. 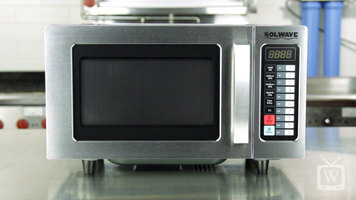 Watch this video to learn more about the Solwave MW1000T commercial microwave! Its quick heating capabilities and convenient cooking time guide will help you warm up your soups, sandwiches, and other foods in no time.